The President’s budget document included a table (S-9) including GDP forecasts (q4/q4). How much of an outlier are these forecasts? I let readers decide. 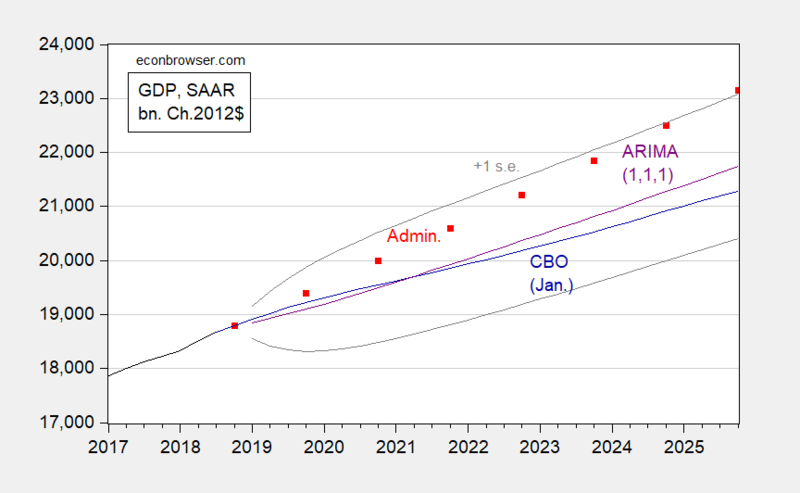 Figure 1: GDP as reported (black), Administration forecast (red squares), CBO January forecast (blue) and forecast from ARIMA(1,1,1) estimated over post-recession period, with plus/minus one standard error, all in bn.Ch.2012$ SAAR Source: BEA initial 2018Q4 release, President’s budget, CBO Budget and Economic Outlook January 2019, and author’s calculations. The Administration forecast is noticeably above the CBO’s forecast (conditioned on current law), even for the current year. (And the WSJ February survey consensus is for about 2.2% q4/q4 growth vs. 3.2% from Administration). By end of 2025, one can conclude that the Administration’s forecast is statistically significantly different (at the 66% confidence level) from that drawn from a naive time series model (in this case an ARIMA(1,1,1) on log real GDP estimated over the 2009Q2-2018Q4 period). The Administration has previously attacked CBO projections. As noted in this post, CBO did underpredict growth over the subsequent two years by an average 0.2 percentage points (over the 1982-12 period), while the Administration overpredicts by about 0.1 ppts. However, the RMSE of CBO’s predictions is typically on par with Blue Chip consensus, and below the Administration’s.